Sunday dinner is my favorite meal to cook, each week! I honor my heritage by cooking for family and friends.......traveling and enjoying deliciously creative, organic whole foods. Cook for those you love, then go out and see the world! 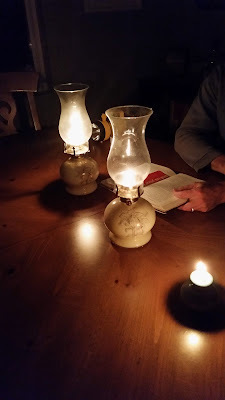 Power was out, but reading goes on! Suffice it to say that our oil lamps are now filled with oil and or a new wick. We have a solar charger for our cell phones on constant charge and I love that our garage is quite cold, helping to keep everything cold and frozen until power was restored. My annual Thanksgiving after Turkey Soup with Lima Beans and Barley, was in process when the outage began. The bone stock was already simmered and ready in the crock pot when the outage took place, It was easy to let it cool and proceed the next day with the rest of the recipe. It is more of a process really, one where you break bones, add water and simmer for 8-10 hours. After that, you strain the stock into a large stock pot to make soup on the stove. Only then do I measure anything, but it is pretty basic and delicious. And like all soups freezes perfectly. Combine turkey stock through barley. Add the canned tomatoes plus a can of water. Bring to a boil, reduce heat and simmer until beans and barley are tender. Add red wine vinegar, taste and adjust final seasonings, add diced turkey. Turkey Soup with Lima Beans and Barley, freeze for easy meals later! Another Thanksgiving enjoyed and now over. This sounds sooo good. I love a good hearty soup, and it's been too long since I've done anything with lima beans. I like them also, as quick and easy as lentils. Thanks for visiting. I love Lima Beans, what a great combination! Hope you have a great week and thanks so much for sharing with us at Full Plate Thursday! It sounds like a very flavorful and satisfying soup. I love barley and bean soups. Thanks for sharing it with Souper Sundays this week. I really like the combo of white limas and barley, and no pre-soaking. Thanks for visiting. Thank you for reminding me to check our flashlights etc! Your soup looks amazing. Love all the wholesome ingredients, Melynda, and it sounds so tasty too. Thank you for being a part of Hearth and Soul. Hope to 'see' you again this week!